The Jeep Cherokee is one of the most iconic SUVs ever made. The original model was released for the 1974 model year, and has been a favorite option for buyers in the crossover SUV segment ever since. Spanning over four decades and five generations, the Jeep Cherokee is as hardy as it is iconic. What started out as a full-size SUV, has evolved into a compact crossover model that is sold around the world. The Cherokee was the inspiration for the brand to create the Grand Cherokee model, which is now Jeep’s most successful nameplate. The Cherokee has long been a staple at Jeep dealerships across the country, and shoppers are finding exceptional value in used Jeep Cherokee models from the crossover’s newest fifth generation. Up until this year, Jeep Cherokee models featured a boxy body style, and were considered compact in size. For the first model year of the Cherokee’s fifth generation, however, Jeep had something entirely different in mind. The all-new, completely redesigned 2014 Cherokee was the surprise of the year, and was what Jeep brand fans were hoping to see when this model was finally revealed to the public. A bold new exterior styling made the newest Cherokee immediately stand out from all previous model years, and made it instantly recognizable on the streets and highways of America. The new sculpted shape of the midsize crossover allowed for enhanced aerodynamics that the outdated boxy style did not allow. As always, the Jeep Cherokee delivered class-leading off-road capabilities that other brands could not match, as well as plenty of on-road practicality. The standard 2014 Cherokee came equipped with a 2.4-liter Tigershark I4 engine that was capable of producing 184 horsepower and 171 lb.-ft. of torque. The only other powerblock option was a 3.2-liter Pentastar V6 which was noticeably more powerful with a horsepower rating of 271, delivering a responsive 239 lb.-ft. of torque. Both engines came with a nine-speed automatic transmission, and the 2014 Cherokee was available with either front wheel drive, or Jeep’s capable off-road four-wheel drive system. Properly equipped, the 2014 Cherokee can tow up to 4,500 pounds, which is more than impressive for its midsize crossover designation. The 2014 model year of the Cherokee was also important in terms of advanced safety technology and connectivity features, both of which were not widely available on previous model years. Forward collision warning, lane departure warning, and rear cross path detection systems were all optional for the first time in the Cherokee’s history, making it even more appealing for buyers looking for an affordably capable pre-owned version in 2017. All in all, this Cherokee model represented a rebirth of one of Jeep’s longest running nameplates in history. Because the Cherokee had just received a redesign of epic proportions, the 2015 model year went into the history books as relatively uneventful. Aside from a few very minor changes, the 2015 Cherokee was still very much a new model offering from the iconic Jeep brand. Those small updates to the 2015 Cherokee model included the addition of a start/stop engine function on Cherokees equipped with the V6 engine, and a low-speed frontal crash mitigation system was made available for the first time in 2015. Other exciting changes included a new safety package which featured a blind spot monitoring system, rear cross path detection, and park assist as a single bundled unit. For drivers with a more refined vehicle taste, the 2015 Cherokee also offered ventilated front leather seats, making it increasingly more appealing for used car shoppers wanting enhanced luxury amenities, for much less money. One of the most recent additions to the Cherokee lineup is the 2016 model. Despite the fact that the best-selling Cherokee model was not updated in 2016, there are still plenty of things that make it a great vehicle to purchase used. Standard 2016 Jeep Cherokee crossovers came with 17-inch steel wheels, remote keyless entry, power windows and door locks, convenient 60/40-split rear bench seats, a tilt and telescopic steering wheel, Bluetooth hands-free integration, a five-inch touchscreen display, and so much more. With such a long list of enhanced features that came standard, new models sold as higher trim levels offered even more of what used car shoppers want in their midsize crossover SUVs. 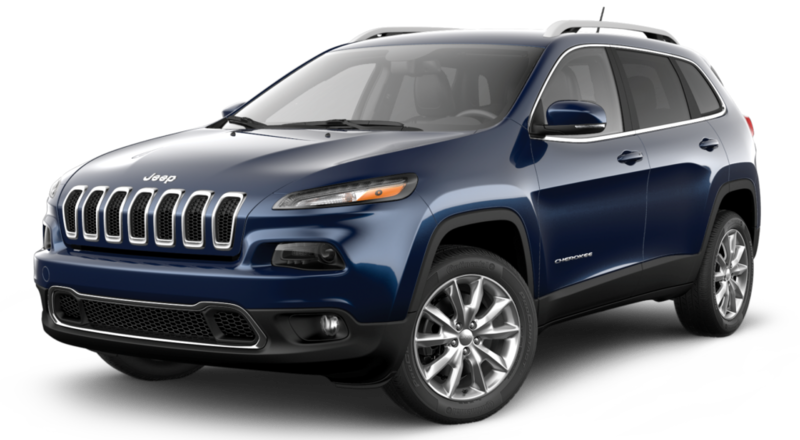 Available options on new 2016 Cherokee models included heated side mirrors, a heated steering wheel, rear backup camera, fog lamps, roof rails, and ambient interior lighting. Leather upholstery, a dual sunroof, power rear liftgate, and a larger 8.4-inch touchscreen display was also offered on this Cherokee model. Simply put, if you want to drive a fully-equipped like-new Cherokee model, a pre-owned 2016 Jeep Cherokee is your best bet. Take advantage of the upgrades that the original owner added when you purchase used, and you’ll save yourself from paying for every add on you want your crossover to have. Believe it or not, used 2017 Cherokee models are already making their way onto the lot here at The Faricy Boys dealership. This adventure seeking SUV starts brand new at $23,595, but is now available to used car shoppers for much less than they would pay for a new version of the exact same model. Still offered with the standard 2.4-liter I4 engine or the more powerful 3.2-liter V6 option, the 2017 Jeep Cherokee is as capable as ever before. Models equipped with four-wheel drive include Jeep’s Selec-Terrain system standard, which turns the Cherokee into an off-road warrior. With an EPA-estimated 28 miles to the gallon on models with Jeeps’ capable four-wheel drive system, buyers will enjoy the ability to explore the world, without paying for it at the pump. The Faricy Boys Jeep dealership is located here in Colorado Springs, Colorado. We have a large selection of high quality certified pre-owned and used Jeep Cherokee models, waiting for you to drive home. You can take them out for a test drive, and decide which year of the Cherokee’s fifth generation is right for you. With multiple trim level options, and even more limited and special editions available, you will be overwhelmed by the seemingly endless possibilities that the newest Jeep Cherokee offers. When you purchase the capable Cherokee model used with The Faricy Boys, you will automatically save money without compromising quality, dependability, or the reliability that the Jeep brand is built upon. Come down to see us today, and start on your journey to Jeep Cherokee ownership. Explore the wilderness of Colorado and the Rocky Mountains with ultimate abandon, from behind the wheel of your new-to-you fifth generation Jeep Cherokee. We can’t wait to show you just how capable this crossover SUV actually is, so stop by today and find out for yourself. The experts at The Faricy Boys are ready and waiting to help you uncover the adventurous side of your personality that is waiting for the perfect off-road ready vehicle.